The SAE is more than just a different kind of school. It is a total experience which transforms the lives of all who attend here. Students carry more than books around on a typical school day. They carry their guitars, sheet music, poetry journals, play scripts and dancing shoes. They dance at lunch and practice their musical instruments or sing. They work with college mentors to assist local businesses improve their bottom line. They are comfortable walking up to teachers and administrators and expressing their opinions. A snap shot of The SAE is one of eclectic, joyful, chaotic harmony. CGU Academy@The SAE Now accepting students from all districts—tuition is free! Summer at The SAE is a free academic enrichment and credit recovery program for children in grades 5-12. Classes are co-taught by certified Master Teachers and student teachers enrolled in the Credential/MA program at Claremont Graduate University. Join The School of Arts and Enterprise on Saturday, May 12, 2018, as we celebrate our dynamic arts education and high school arts majors through the 2nd annual SAE Arts Festival. 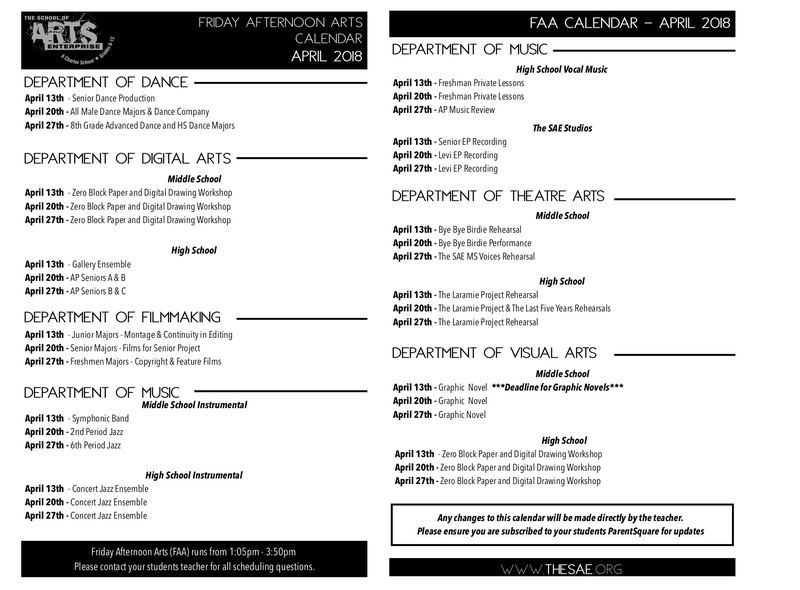 The SAE Arts Festival will serve as a way of sharing our dynamic programs and supporting the artistic mission of the Historic Pomona Arts Colony. This event is free and open to the public. The School of Arts and Enterprise proudly presents the Senior Recital of Sofia Levi (Class of 2018). Through her short time at The SAE, Miss Levi has been an example of what the dynamic arts programs at The SAE can unlock in a student's creativity. From her concert appearances to her musical theatre work, Sofia has proven that her immense talent and career are truly just beginning. Miss Levi will be joined by numerous special guests and Caelin Eager on the piano. Join The School of Arts and Enterprise at the historic Covina Center for the Performing Arts for this culminating event. Extremely limited tickets remain - please visit www.saetix.com for best availability.